There are nods of recognition around the room as Sean Walker runs through a list of known offenders who are out of prison and could soon be causing issues again in Leeds city centre. Gathered around the table are more than a dozen security staff from the city’s biggest department stores, shopping centres and supermarkets. They are here for the weekly security briefing for retail members of Business Against Crime in Leeds (BACIL), a partnership which brings business from the day and night-time economy together to reduce crime and anti-social behaviour. 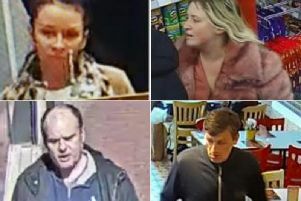 Naturally, known shoplifters who are active in the city are a major focus, with updates on bail conditions, talk about plans to seek exclusion or criminal behaviour orders, and members asking for help in identifying suspects caught on CCTV. A store caution has been issued to a man with no previous convictions for shoplifting, but who is well known to police for bike thefts, burglary and thefts outside shops. Another known shoplifter has been released from prison in Lancashire and is back to targeting phone shops, while a well-known beggar has been caught on camera stealing a charity box from behind the counter of a restaurant. Aside from the shoplifters, there is talk about two different men caught outraging public decency and another who has been harassing female customers. It is incidents like these that can also be shared in real-time via the BACIL radio network, meaning shop staff in the city centre and beyond can be on the lookout for people creating issues. The three-strong BACIL team have bases at Leeds Central Police Station and the Merrion Centre, but the majority of their time is spent out in the city centre and at the other key locations where they have members across Leeds. Sean said: “People know Rachael, Sean and Tony from BACIL. “They might not know our surnames but they know our faces. “The idea is to get out there and to spend as much time out there as possible. With the meeting completed, Sean heads into the city centre to have a chat to staff at a member shop that had reported an incident involving a known thief who threatened violence when confronted. He listens to their concerns and shares advice, stressing the importance of calling 999 if there’s a repeat incident. The next stop is a city centre retailer which has seen a significant drop in losses to shoplifting since signing up as a BACIL member. It is hard to miss the wall of images of known shoplifters in the staff area, just one way the company has improved its detection rates. The manager explains: “We got to a point where we got really huge losses compared with what we had been going in the past. It was gradually getting worse. Staff have been trained how to spot shoplifters and the techniques they use, and having the confidence to detain suspects until police arrive. Crime maps, offender profiles and daily briefings are at the fingertips of those with access to the Business Against Crime in Leeds (BACIL) website. Tied together with the BACIL app, radio network and staff training, it is part of a membership package designed to give businesses the knowledge they need to play an active role in reducing crime. BACIL manager Sean Walker said: “On a morning we use the police computer. We check all incidents that have happened right across the city. We check the city centre, Crown Point Shopping Park, Owlcotes, Kirkstall, Colton, Armley and Birstall. This information is used to pull together daily briefings on the website for retail members as well as the bars and restaurants at the heart of the city’s night-time economy. Members can upload images of people who have carried out offences in their shop or bar, look through existing profiles to see if there is a match, or comment on images shared by others to provide potential identities. Offender profiles on the website are also linked to any individual incidents in which they are involved and to other criminals who they are known to work alongside. The website, designed by Leeds-based SentrySIS, has an accompanying app which is used to send notifications not only about crimes but also missing people and other vulnerable people. Such messages are also shared on the BACIL radio network to which police and the city’s LeedsWatch CCTV camera operators have access. “If we’ve got somebody who needs support on the street, members can get on the radio and get people down there,” Sean said. Meanwhile, a trial is due to begin of a crime reporting system already in use by Durham Constabulary. It will allow selected BACIL members to use the organisation’s website to report a crime, upload their statement and digitally share the CCTV footage to speed up the investigation process and save officer time.